The Vega 100 series is available in three models, Vega 200, 400 and 700. All offer total flexibility with configurable I/O in any mixture of physical interfaces such as coax, fiber, HDMI, balanced and unbalanced AES and MADI. 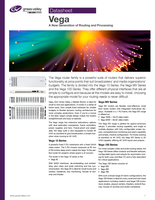 Input embedding and clean and quiet switching is available on all outputs if you desire, it’s up to you how you configure your Vega 100 router series. Available in SDI, ASI and 4K UHD as standard, the Vega router range is the perfect solution for applications such as houses of worship, OB trucks, playout, entertainment and flypacks when command stability with full redundancy and fast configuration in such flexible environments is a must. Note: SDI re-clocking circuitry is contained in VG-RM6SFP-SDI. All SFP modules are non-reclocking. Blue Output (Tx) = "OK"
Note: FOCIS = Fiber Optic Connector Intermateability Standard. Power -2 dBm typical, -5 dBm min, 0 dBm max. -2 dBm typical, 5 dBm min, 0 dBm max. Extinction Ratio 7 dB min. 7 dB min. SM-RR-3G dual RX is also for use with dual CWDM TX below. Extinction ratio: 9 dB min. Note: 18 CWDM Tx wavelengths available in 9 dual SFP modules conforming to ITU-T-REC-G.642.2. Clasp (Latch) Color Code is for Channel 1 CWDM wavelength. Note: CWDM link distance depends on mux/demux attenuations. Signal Amplitude: 950 mVp-p max. AES: Transparent to VUC bits. Parity regenerated on outputs. The Vega audio crosspoint also has 6 MADI inputs and 6 MADI outputs. Together with internal audio connections to and from processing and AES cards, it routes signals from any MADI, AES or embedded input to any MADI, AES or embedded output. The audio router card must be installed when routing audio to or from any video channel on a processing card. Routing between AES inputs and outputs only does not require an audio crosspoint. Note: The mainframe is supplied with one PSU, one crosspoint card and one controller card. Dual redundant PSUs and/or cards are purchased separately and fitted prior to system test and dispatch. Either none, one, two or all three options should be purchased (per mainframe) depending on the level of redundancy thought to be appropriate. For critical ‘Live’ applications, all three DR options are recommended. Alternatively any option can be purchased for upgrade on site at a later date or simply for spares/replacements. The Vega router family is a powerful suite of routers that delivers superior functionality at price points that suit broadcasters' and media organizations' budgets. The family is divided into the Vega 10 Series, the Vega MV Series and the Vega 100 Series. They offer different physical interfaces that are all simple to configure and because all the models are easy to install, choosing the appropriate model for your routing needs is never difficult.